Posted May 29, 2014 by NBYT1 Comment on The Making of JAMES AND THE GIANT PEACH: The Costumes	"Making of..."
This post was contributed by Denise Clapsaddle, costume designer for James and the Giant Peach. While some plays benefit from a minimalist set and costumes—you know, like black body suits for the actors and a couple of chairs on a bare stage—James and the Giant Peach isn’t one of them. People rightly expect something, well, big from this production. But the title doesn’t just imply something big, it implies a great deal of whimsy as well (Giant peach? What in the world is a giant peach?) The script lists the time in which the play is set as “the past.” While some creative teams pick a particular time period to set their version of James (such as the Victorian era, or the 1950s), many do as we have done—create a whimsical and anachronistic world in which one character is dressed in a zoot-suit-style jacket while another wears early-60s-glamour-style glasses. All theaters operate within a budget, and they stretch that budget by re-using and borrowing costumes. 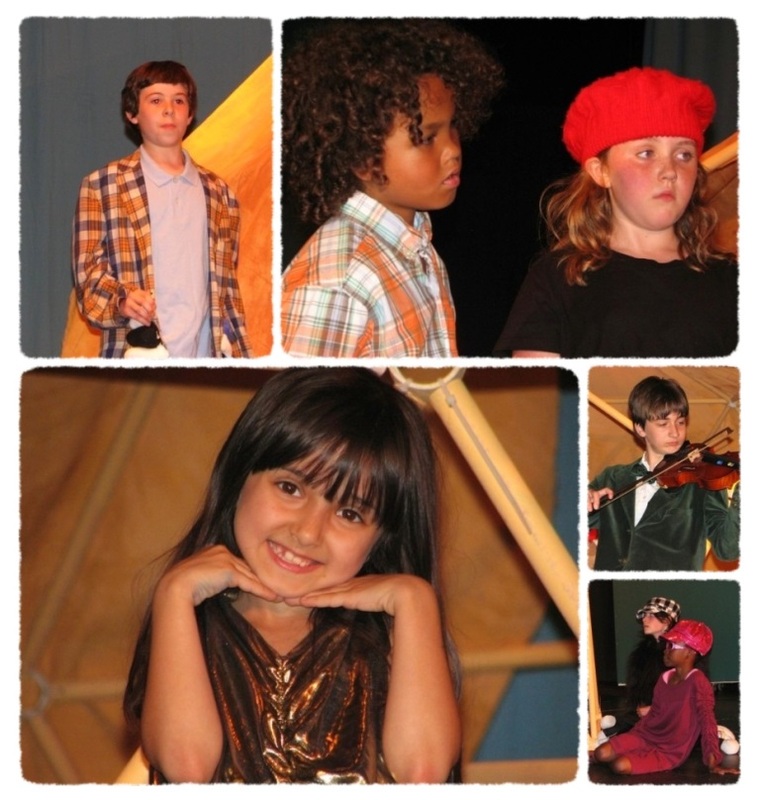 When I started as a costumer on one of the first productions of this theater, NBYT owned no costumes. Four years later, through careful shopping and donations, our costume closet bursts at the seams. Because we do seven major productions plus a number of in-school and homeschool share day productions, as much as possible we try to use generic items that can be easily repurposed. Yesterday’s wolves from Babe the Sheep Pig can, with a little creative addition and subtraction, become today’s sharks and seagulls for James and the Giant Peach. NBYT is also blessed to draw from the collections of other theaters and costumers. We inherited our spider costume from a now-disbanded theater. Nightwing Whitehead, another costumer that works with NBYT, loaned us some of the costume pieces for the ladybug and the grasshopper. Other costumes have been built in conjunction with our puppet builder, Lisa Del Cegno. Lisa added the centipede feet to the centipede costume, created the silk worm puppet, and put the glow into the glow worm. Another important aspect of costuming at NBYT is participation by parents and by the actors themselves. Parents and kids often suggest bringing in items owned by the actors. Backstage, while their children rehearse, parents perform such important though mundane-seeming chores such as gluing shark fins into t-shirts and seagull beaks onto visors. We couldn’t do it without them. I hope that they had fun doing it. I know I have enjoyed getting to know them as we worked together on these projects. The life of a show is relatively brief but intense. The actors and backstage crew come together for a few weeks or months of hard work and then after a weekend of performances it’s all over. Some costume parts go into the trash, but most are carefully cleaned and returned to the costume closet to live another life in a different theatrical world. Next Next post: What’s Next for NBYT?